With the introduction of Addmen's OMR software, printing OMR sheets has become easy as well as economical. Earlier, OMR printing required the use of special thick papers. However, today this can be done with normal white paper that we use for our regular printing. Also, you do not have to get the printing done by special OMR printers. You can do this on your own with a laser or inkjet printer. 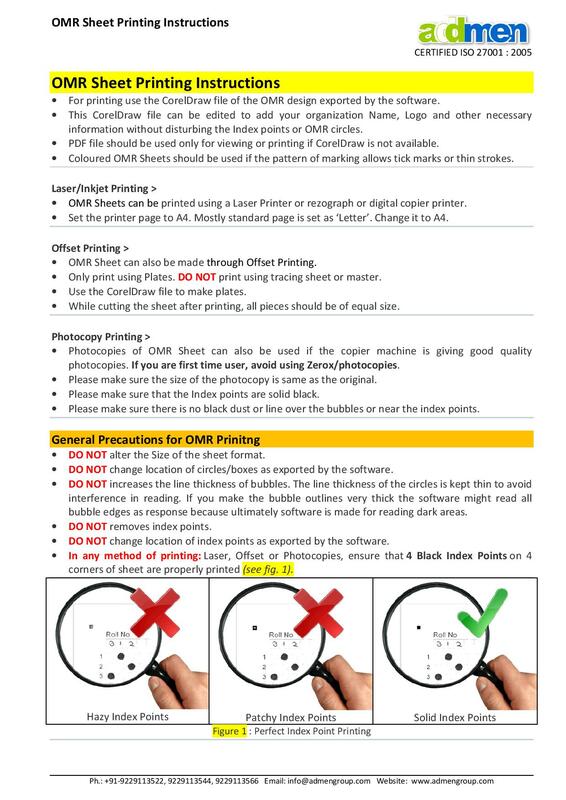 Here is an OMR printing overview. OMR sheets can be printed using any regular inkjet or laser printer. Apart from these printers, rezograph, photocopy, network print stations, etc. can also be used for this purpose. In case you need huge quantities of OMR sheets, it is best to get them printed at an offset printing press. The size of the OMR sheets can be anywhere from that of a small stamp to an A3 size paper. The OMR software provides the facility of designing sheets in these sizes. However, A4 size paper is generally used for OMR sheet printing as the printers and scanners suitable for A4 size paper are easily available as are the papers. Earlier thick papers were required for printing the OMR sheets. But today there is no such requirement. Paper with a thickness between 60-80 GSM is perfect for OMR sheet printing. Although thick papers are not required for accurate reading of the OMR sheets, these are used for examinations, as in these cases, the papers have to undergo a lot of wear and tear. In order to ensure that the OMR sheets are not damaged while handling, filling and packing, most examination committees prefer the use of thick OMR answer sheets, as damaged sheets cannot be scanned and read properly. Colored OMR sheets are required when the bubbles on the OMR sheets have to be marked with a small tick mark and not filled completely. In this case, the OMR sheets should have two colors: one black and the other can be pink, orange, yellow or red. It is best to avoid colors like green, grey and blue. 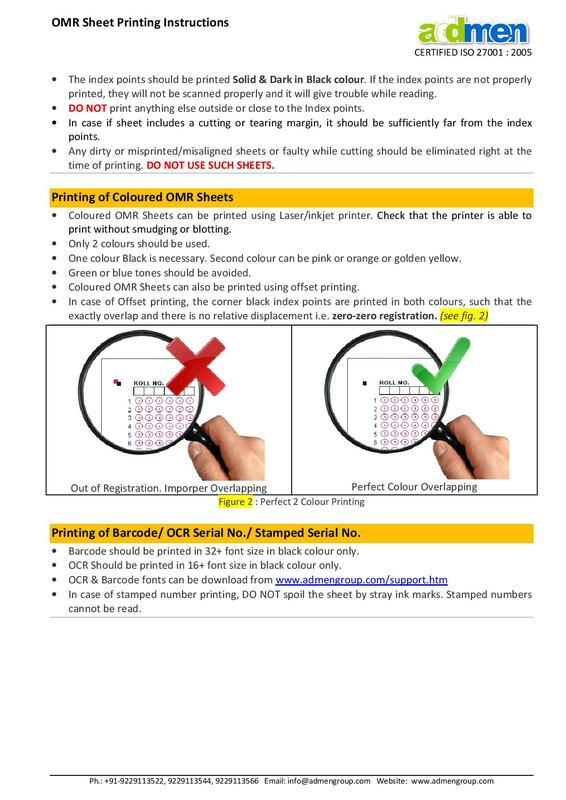 Just like the black and white OMR sheets, you can print the colored OMR sheets yourself. You will need to use a colored inkjet printer for this purpose. If a barcode has to be printed on colored sheets with an inkjet printer, you have to ensure that it is not smudged. Use the OMR software to design and print OMR sheets and save money as you do not have to use any special printer or paper for this purpose.